I just never expected toilets to be one of them. I had been standing on a sun-dried bluff in Jeremie, Haiti, looking out over the inviting turquoise waters of the Caribbean, and her inviting waves gently licking the sandy beach a hundred meters away. In between lay a swath of about 150 tightly-clustered one- or two-room shack-like homes. The community was perhaps the poorest in town. Their tattered tarp roofs told the story of why I was there. Overshadowed by last year’s triple-threat hurricane season, many have forgotten Hurricane Matthew’s destructive march across Haiti’s western peninsula, the east end of Cuba, and then up the U.S. coast late in 2016. Heaven’s Family responded with emergency relief supplies, including tarps for temporary roofs. Standing with me was Mark Stockeland of Haiti Bible Mission, a man who grew up in Jeremie, gaining fluency in the language and culture. Partnering with Mark, Heaven’s Family’s Disaster Relief Ministry helped thousands of Haitians affected by Matthew. That hilltop, Mark explained, was the public toilet for the poor, tarp-roofed neighborhood below us. A merciful ocean breeze kept the smell at bay that day, but I could see how users of the “facilities” would be completely exposed to the weather—and nosy neighbors. But the hurricane provided an unusual opportunity for Mark. A gang leader named Watson controlled this community and much of the town, and for years had frustrated Mark’s efforts to make inroads for the gospel. But one day after initial disaster relief efforts, coordinated largely by Mark, he asked Watson what his community needed. “Toilets,” he gruffly replied with little hesitation. Seeing a door into the heart of Watson—and his community—Mark agreed to help. Strapped for funds after the hurricane, however, he could only assist with the first phase—digging the pit. Mark lifted a large, temporary wooden cover to show me a stone-lined pit about 6-feet by 10-feet by 30-feet deep. He then told me it would cost $4,000—which he didn’t have—to finish the multi-stall toilet facility over that hole. Funds were soon wired for the project, and work began almost immediately. Residents of the community expressed joy and gratitude for their new facility. Watson’s hard heart was visibly softened. In the months that followed the Disaster Relief Ministry stepped in again, this time with hundreds of corrugated metal roofing sheets. 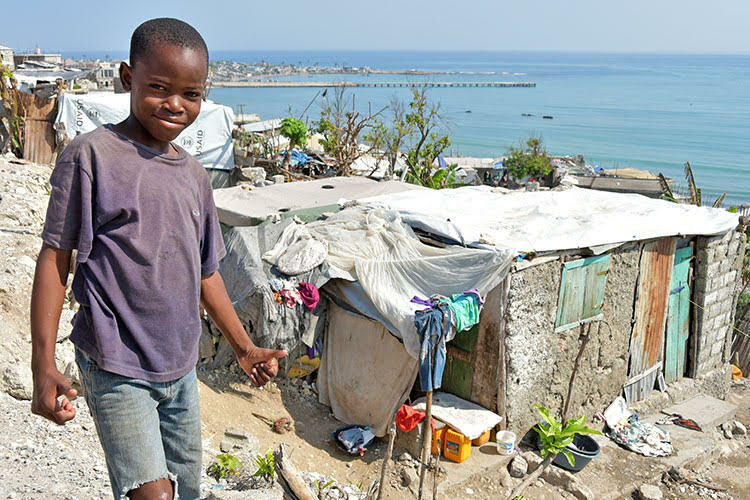 Working with Haiti One, a ministry that seeks to coordinate the many mission organizations working in Haiti to maximize impact and efficiency, we gained volume pricing that allowed Heaven’s Family to help reroof 100 homes! The view from that same bluff is now dramatically different—shiny metal roofs instead of leaky, thread-worn tarps. Even better, Watson and Mark are now friends, working for a common cause. Watson and his community have seen the love of God in action, and can no longer ignore the Holy Spirit’s promptings. Watson has attended church several times, Mark reports, and is “very close” to surrendering to Jesus. This was another lesson in how Heaven’s Family’s Disaster Relief Ministry provides hope, not just to people suffering temporary hardship from hurricanes, floods, earthquakes and fires, but, even more importantly, for eternity with their Lord and Savior Jesus Christ. Natural disasters can be filled with hope when we ask Him to show us the sometimes-hidden opportunities—such as new toilets that bring relief from spiritual darkness. 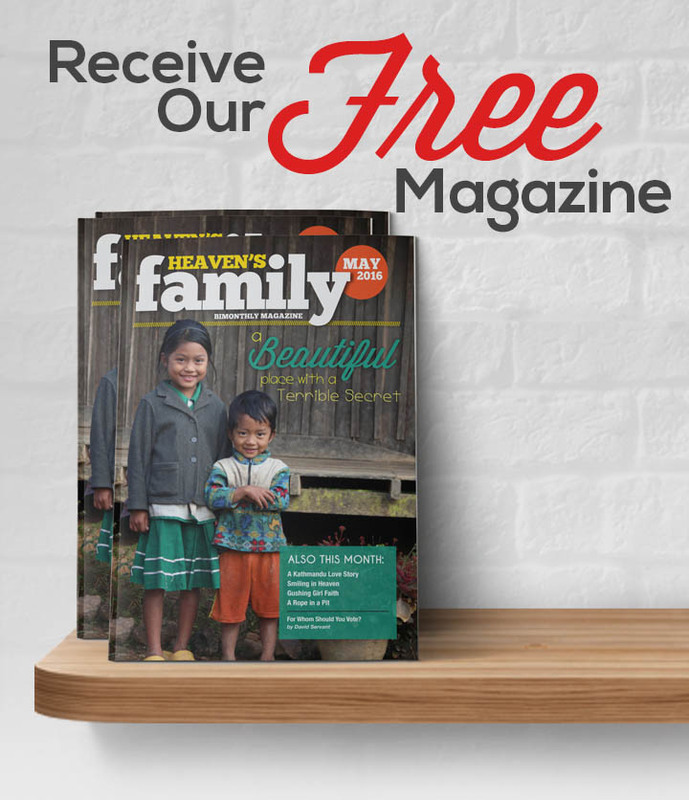 We’ve heard countless stories of how Heaven’s Family has helped open hearts for the gospel around the world. By partnering with Jesus’ followers who know the culture, language and needs of the people, we’re able to empower them for long-term evangelistic efforts that bear much fruit for Jesus’ kingdom. We’ve also seen partners in lands of persecution receive favor from those who once persecuted them—all made possible by the many who have sewn generously into this ministry.